Chemical equilibrium is defined as the dynamic condition reached by a reversible reaction when the direct reaction and the inverse reaction occur simultaneously. A reversible reaction can proceed in both forward and backward directions. Equilibrium is reached when the rate of the forward reaction equals the rate of the reverse reaction. All reactant and product concentrations are constant at equilibrium. The equilibrium constant can be used to determine if a reaction is at equilibrium, to calculate concentrations at equilibrium, and to estimate whether a reaction favours products or reactants at equilibrium. 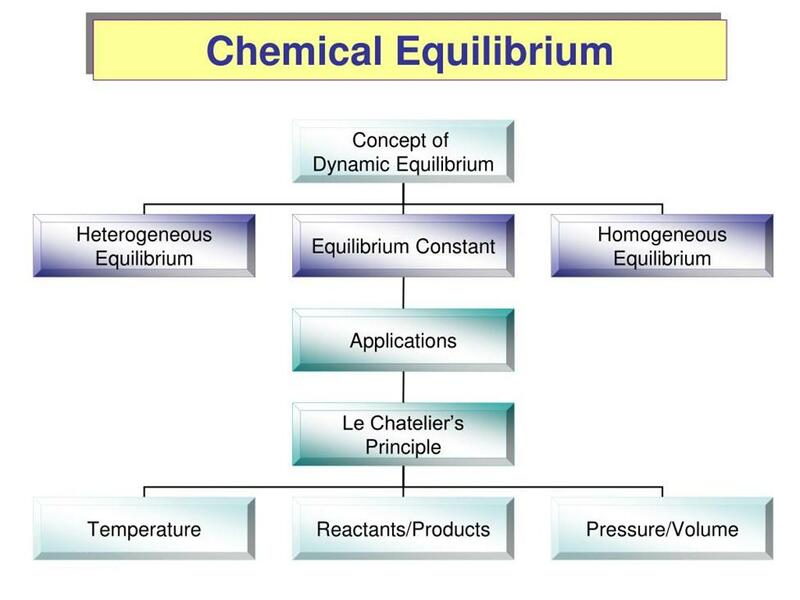 Le Châtelier's principle: if a chemical reaction is at equilibrium and experiences a change in pressure, temperature, or concentration of products or reactants, the equilibrium shifts in the opposite direction to offset the change. A chemical reaction is a process in which one or more substances, the reactants, are converted to one or more different substances, the products. Substances are either chemical elements or compounds. A chemical reaction is complete if the reactants are completely transformed in products at the end of the process. A single arrow is usually used for writing an irreversible reaction. There are many reactions which are incomplete under given conditions: the products that are formed react with each other to restore the starting reactant. These are called reversible reactions. A double arrow is usually used for writing a reversible reaction, indicating that the reaction happens in the same time in both directions. 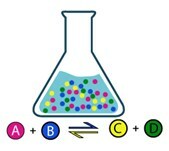 Reactant A with reactant B creates product C and product D. In the same time C and D generate again A and B. The reaction rate depends on the concentration of the reactants. At the beginning the quantity of reactant is the highest, thus the rate of product formation is the highest. As the reactant amount decreases, also the rate of reactant transformation decreases and the rate of product formation increases. After a certain time, the concentrations of reactants and products become constant and this state is called equilibrium. It is important to notice that the reactions never stop in equilibrium phase but both direct and inverse reactions are happening at the same time and at the same rate. As a result, the concentrations of the substances do not change. One example of a reversible reaction is the formation of nitrogen dioxide, NO2 from dinitrogen tetroxide, N2O4 (gas phase, g). 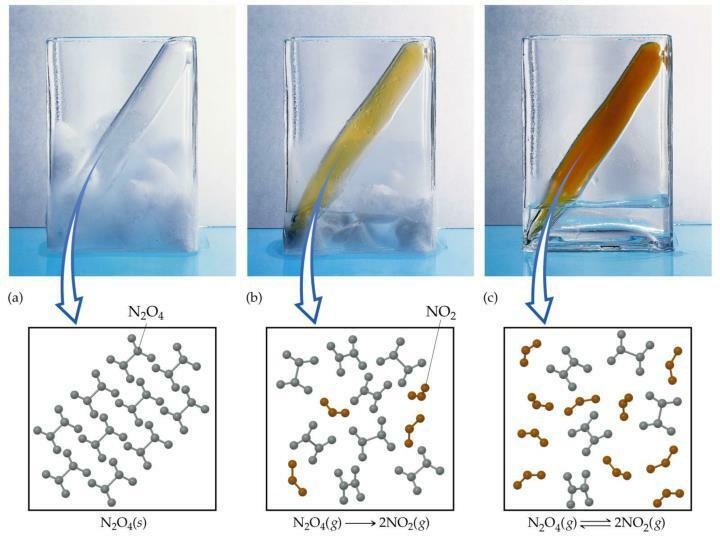 If we add some colorless N2O4 to an evacuated glass container at room temperature, over time, we observe the gas changing to a yellowish orange color and gradually getting darker until the color remain constant. 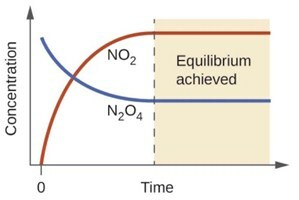 We can report in a graph the concentration of NO2 and N2O4 over time for this process, as you can see in the graph below. The c in the subscript stands for “concentration” since the equilibrium constant describes the molar concentrations, in mol/L , at equilibrium for a specific temperature. The equilibrium constant can help us understand whether the reaction tends to have a higher concentration of products or reactants at equilibrium. We can also use it to determine if the reaction is already at equilibrium. If Kc is very large, ~1000 or more, we will have mostly product species present at equilibrium. If Kc is very small, ~0.001 or less, we will have mostly reactant species present at equilibrium. If Kc is in between 0.001 and 1000, we will have a significant concentration of both reactant and product species present at equilibrium. If at the equilibrium all the chemical species are in the same phase, we call it homogeneous equilibrium. For solutions, they are all dissolved, and for gaseous equilibria, they are all gases. However, we can also talk about equilibria in which not all of the species are in the same phase. These equilibria are referred to as heterogeneous equilibria. An example of a heterogeneous equilibrium would be when an ionic compound partially dissolves in water or the decomposition of calcium carbonate, CaCO3. Any time we put something in the square brackets, this means that we need its concentration. Because CaCO3 is a solid in this process, it doesn't really have a clearly defined concentration. As a result, we just leave it out of this expression. Likewise, whenever you have a pure solid or a pure liquid (but not a solution) in an equilibrium expression, you leave it out of the expression for Kc. Another example is the decomposition of calcium carbonate.CaCO3, a solid, will produce calcium oxide, CaO, also a solid, and carbon dioxide, CO2, a gas. This equilibrium is only established if the calcium carbonate is heated in a closed system, preventing the carbon dioxide from escaping. It is important to remember that solids and pure liquids are not included in the expression of the equilibrium constants so in this case, the only thing in this equilibrium which isn't a solid is the carbon dioxide. That is all that is left in the equilibrium constant expression. The equilibrium state depends on temperature, pressure, or concentrations. This means that the change of one or more than one of these parameters stimulates a response that partially offsets the change while a new equilibrium condition is established. This is the Le Châtelier's principle. In 1884 the French chemist and engineer Henry-Louis Le Châtelier proposed one of the central concepts of chemical equilibria, which describes what happens to a system when something briefly removes it from a state of equilibrium. 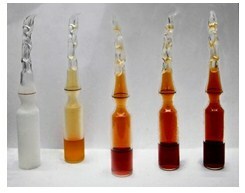 In the example below, you can see how a change in the temperature can shift the equilibrium of this reaction.